Warlord Games Secure Rights to Doctor Who! Wow, really wasn't expecting this. Warlord Games has secured the rights to produce a miniatures game based on Doctor Who. Yes really! Look here. I always thought that 7TV was Crooked Dice's attempt at doing a v.2 of the existing DWMG. Of course Crooked Dice go to great lengths to make sure that character names do not breach copyright in 7TV and the Doctor Who emphasis has perhaps been reduced in recent years. Seems like an age since I posted anything. But fear not, progress on several fronts is being made... One of my challenges this year was to complete an early war German army for Bolt Action. Painting has been progressing (slowly) and I have been busy constructing, basing and undercoating 1500 points worth of models. In fact I've even put together a British Expeditionary Force for Kyle. Painting the Brits won't occur for a while, but the figures are at least undercoated so we can play some games. Last week we had an enjoyable stay in Northumberland. This was a good opportunity to visit some important Roman and Dark Age sites; including Hadrian's Wall, several Roman forts and of course Lindisfarne. After a visit to one Roman fort we headed back to our holiday cottage and I made the mistake of checking eBay. 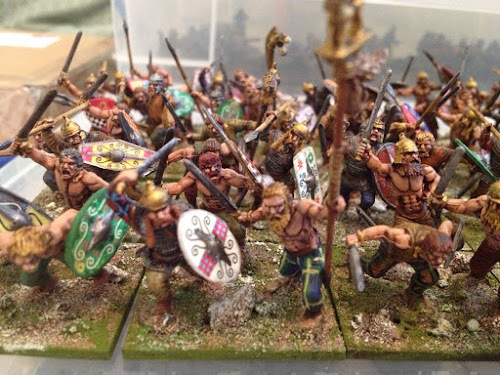 I have plans to put together an Ancient Britain Celt army that will mostly get used for Hail Caesar (although some individually based figures may well find their way into games of SAGA and Lion Rampant as well). I've even started purchasing various models with the intention of starting to paint them next year... But a playable army is going to need a *lot* of figures. Well, some chap on eBay appeared to be selling a fully painted and based army consisting of medium cavalry, five warbands, two Skirmisher units and a couple of commanders. All told 150 painted figures. I've never bought prepainted figures before. 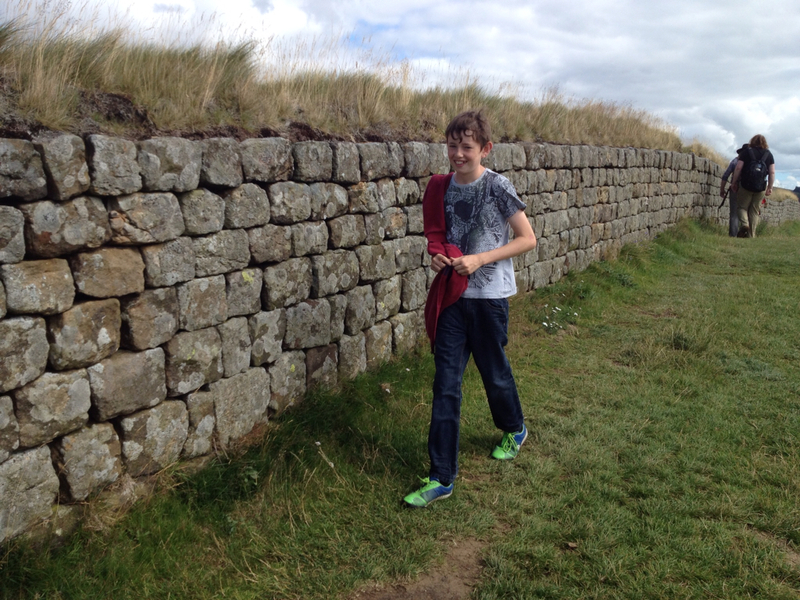 You have to understand that I had just got back from a Roman fort and was, as they say, in the zone. Yep, I bought them. About 190 points worth. They arrived today and very pleased I am too. As I say, don't tell the wife. This lot makes a useful starter army and means I can start playing games at the local club right away. I'll even be able to join the mega Hail Caesar extravaganza planned by the Friday Night Fire Fight Club for November. Of course, I still need more Celts. Lots more Celts. 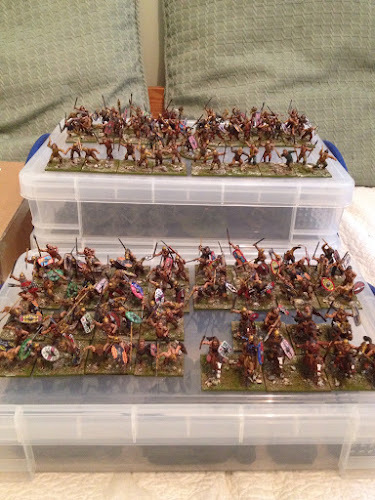 Light cavalry, more warbands, naked fanatics and chariots are all needed for a fully rounded army. So still lots for me to make and paint. But that's a project for 2016. Next on this year's to do list are various terrain items for our participation game of Back to the Longship at SELWG in October.